Image for representation only. Not all colours and wheels are available on model displayed. Please see your dealer or visit Build & Price for full option details. When properly equipped. Specific model and optional equipment are required to achieve the maximum ratings shown. See your retailer for full details. The 2018 Dodge Challenger is a muscle car inspired by Dodge heritage. Explore powerful performance features & packages. 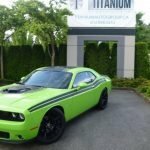 Build & price a 2018 Challenger. Starting at “Starting at” price represents the Manufacturer’s Suggested Retail Price (MSRP) for the base model minus Total Discounts (where applicable). Price does not include taxes, freight (from $1,795 to $2,595), insurance, registration, licence, A/C charge, retailer administration fees and other charges, and new tire duties (in Quebec). The 2018 Dodge Charger is a full size sedan with a muscle-car heritage. Explore the supercharged features & high performance capabilities of a 2018 Charger. The 2019 Charger’s modern technologies start with its Uconnect ® multimedia centre. Read More The 2019 Charger’s modern technologies start with its Uconnect ® multimedia centre. The Uconnectcommunication,AutoUconnecttouchscreenGuardian. ® 4 multimedia centre features a 7-inch touchscreen and to enhance the functionality of your smartphone, includes hands-free Driving while distracted can result in loss of vehicle control. The 2018 Dodge Journey is a crossover fueled by adventure. Start your adventure by exploring the features, and the build & price tool of a 2018 Journey. 173 horsepower and 166 lb-ft of torque, paired with a 4-speed automatic transmission with torque management system. See Full Engine Specs 283 horsepower and 260 lb-ft of torque paired with a 6-speed automatic transmission with semi-manual mode. See Full Engine Specs Image for representation only. Not all colours and wheels are available on model displayed. The 2018 Dodge Durango is a rugged yet refined Dodge SUV. Explore the features of this fully capable, mid-sized SUV. Build & price a 2018 Durango today. Build & Price Canada’s Best Selling engine, Based on IHS Markit Automotive Canadian New Vehicle Total Registrations 2012 to CYTD September 2017. the standard 3.6L Pentastar TM VVT V6 features 295 horsepower and 260 lb-ft of torque. See Full Engine Specs The 5.7L HEMI ® delivers Best-in-Class power Based on WardsAuto Mid-size Sport Utility segmentation and combined horsepower and torque ratings. The 2018 Dodge Grand Caravan is a versatile minivan for all your daily duties. Explore features of this family minivan and price a 2018 Grand Caravan today. 283 hp and 260 lb-ft of torque paired with 6-speed automatic for outstanding fuel economy and excellent towing capability. See Full Engine Specs Image for representation only. Not all colours and wheels are available on model displayed. Please see your dealer or visit Build & Price for full option details.